The Type I Safety Cans are for safely carrying and storing gasoline and flammable liquids. Brass flame arrestors are located in the filler opening and pour spout. The safety cans have a powder coated paint fish and are made from 24-gauge galvanized steel. 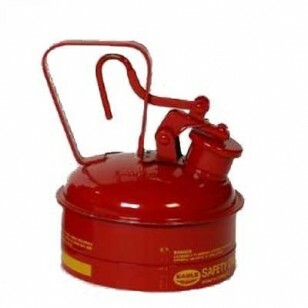 Available in three colors; red for gasoline, yellow for diesel, and blue for kerosene. UL, ULC and FM approved and meet OSHA requirements.